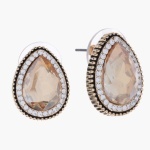 Spruce up your attire with this exquisite pair of stud earrings. Featuring a pear-faceted stone at the centre, it emanates a dainty allure. The miniscule glittering stones accenting the central embellishment highlight the overall design.